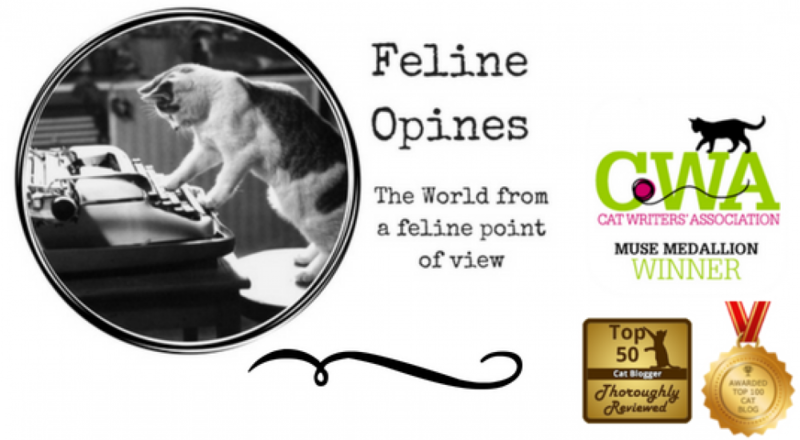 This entry was posted in BlogPaws, cat behavior, Cat blogs, Cat Health, cats, shelter cats, Siamese cats, Top 50 Cat Bloggers and tagged cats and pumpkin, Feline Opines, Raw Paws pumpkin powder, The Tribe of Five, Tucker by Feline Opines. Bookmark the permalink. I asked The Female Human and she wasn’t sure if you could get this product in the UK but I sure hope so. And thank you for the compliment! Wonderful news. And your peeps worked hard to make things better for you. You need to give them extra love. Glad things are moving right along for you, Tucker! MOL! That’s a good one! It’s good to know that this is available – no one in our furmily needs it – yet-, but we’ll make a note of this! Speaking of pumpkins, Saphera planted one and it was doing great, then we got loads of rain, and that pumpkin sucked in more and more water until it literally exploded… Saphera doesn’t know what to make of this (she likes eating pumpkin, but has never encounteredan exploded one, previously). Meowza, exploding pumpkins?! Now that would surely scare this feline! Tell Saphera I’m sorry she lost her fresh pumpkin. Ah, growing pumpkins would be fun but the Female Human is not so great as a gardener…she even buys our cat grass! We hadn’t heard of that one and it could be useful in our neck of the woods, thanks for telling us about it! It’s a purrfect solution for felines (and barkies) with a purrticular problem. Brody needs this so he won’t need another enema. Oh poor Brodie, I feel his pain, that’s what they did to me on my two hospital visits but I was in such a situation they had to sedate me. I hope Brodie can try this and never, ever have to have another one of those procedures! Oh, Tucker, you are gorgeous! Never thought of giving it to a cat, but if it is natural and works, why not? Though I will say pumpkin pie does not seem to have an effect on them, or am I forgetting? Our humans were surprised too but it does help. Don’t know about the pie, none of The Tribe of Five has a sweet tooth. I have one that likes the taste. Maybe your Female Human should slip some of that powder into your male human’s food. It might be worth a try!